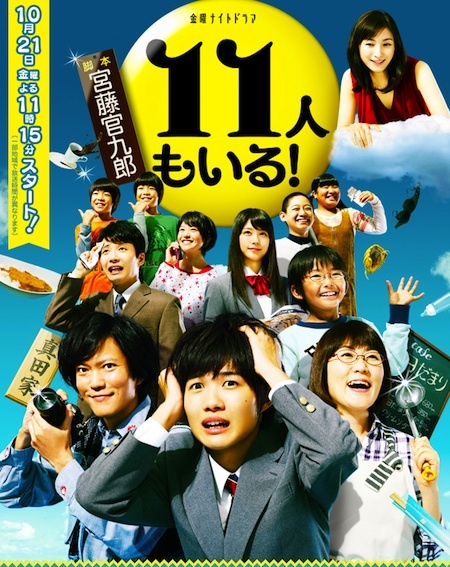 Romaji: 11 Nin mo Iru! Minoru Sanada (Seiichi Tanabe) is a cameraman with little skills in his profession. His wife Megumi (Yasuko Mitsuura) runs a cafe, but the cafe doesn't have any customers. Yet, the couple has 8 chidren. I really need to praise Kamiki for his wonderful acting, also young Kato is doing really well. I find Mitsuura's acting especially halarious too. The actors timing is great, the music's timing too btw. This series is cracking me from beginning to end. I love it, and rewatching it it's stil halarious. darkmax Oct 28 2011 2:02 pm Except for Hirosue Ryoko, everyone else is generally below average in the looks department.